Wilton’s gel food colouring has a tendency to turn brown when baked. When I first started making French macarons, regardless of how vibrant the batter was before baking, the final product always turned out brown. The reason? I was using Wilton’s gel food colouring. Since then, I’ve switched to powdered food colouring and it works splendidly. In fact, it works too well. I burnt the bottom of the tart shell because the abundance of food colouring in the dough meant that it went straight from vibrant red to black in just a few minutes—there is no progressive browning like you would see with un-dyed tart shells. No matter, since after I scraped off the burnt bits the shell tasted great. Inside the tart, starting from the bottom, is a thin layer of melted white chocolate. The purpose of the white chocolate, as I’ve written about before, is to prevent the tart shell from absorbing too much moisture from the pastry cream. The chocolate acts as a barrier. More importantly, in my case, the white chocolate held together fragile parts of the tart. Since I didn’t have a square tart ring, I had to use a tall square pastry ring/mould. I cut out a square of dough, placed it at the bottom of the pastry ring, and then placed strips of dough in the ring to form the sides of the tart (the dough didn’t go to the top of the pastry ring). The connection between the sides and the base was weak, and thus the white chocolate helped keep everything together. You won’t have this problem if you don’t go with a square shape, and you definitely don’t have to. Above the white chocolate is a very thin layer of almond and rose pastry cream (you can’t see it in the photo) and then a layer of almond sponge cake. Above that is a thick layer of the pastry cream and strawberries, sliced into quarters. I decorated the tart with mint sprigs, dried rose petals (I bought these on my recent trip to London), and toasted meringue. If you’d like to keep it simple, you can skip all of these decorations or pick and choose the ones you like. Some sprout leaves, like I used in my key lime and raspberry tarts, would be very nice here too. 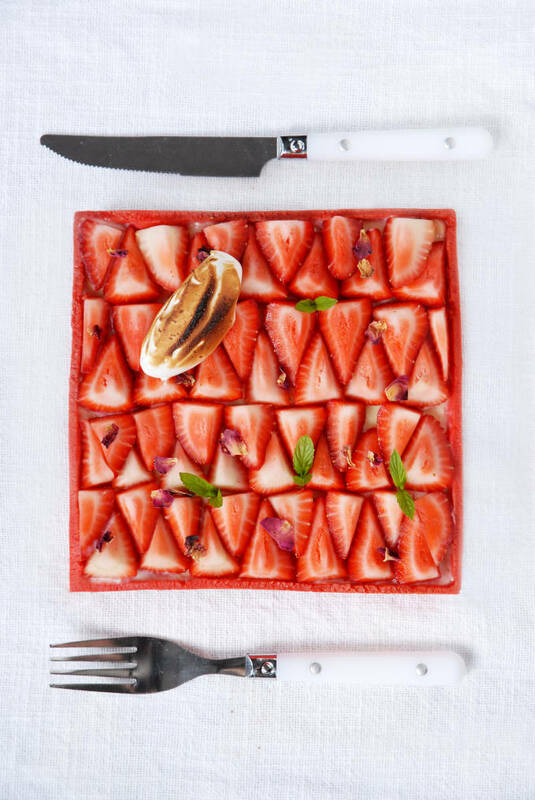 This tart is perfect for summer and is loaded with strawberry flavour. The almond and rose notes are a delight! Elements of this tart are adapted from recipes by Antonio Bachour. Meanwhile, place the milk in a medium-sized pot and bring to a simmer over medium-low heat. Transfer the mixture back into the pot and, over medium-low heat, whisk regularly until thickened and smooth. Whisk in the rose water and almond extract, to taste. Once chilled, and right before assembling, whisk until smooth. Place in the freezer to chill for at least half an hour. Meanwhile, preheat the oven to 325°F (160°C). Preheat oven to 180°C (350°F) and line a quarter sheet pan with parchment paper. In a food processor, grind together the almonds, 35g sugar, salt, and eggs. In a large bowl, whip the egg whites and the 15g of sugar to stiff peaks. Fold the almond mixture into the egg whites, being careful not to deflate the egg whites too much. Fold until smooth. Spread onto a quarter sheet pan lined with parchment paper. Once cooled to room temperature, cut out a piece to fit into your tart shell. Spread the white chocolate on the bottom of the tart shell. Spread a thin layer of pastry cream on top of the white chocolate and the cake on top of that. Cover with pastry cream. Decorate with strawberries, as well as mint sprigs and dried rose petals, if using. If you’d like to add meringue too, whip the sugar and the egg white to stiff peaks. Spoon some on and torch with a blowtorch until browned. STUNNING! You never cease to amaze me with your creations! 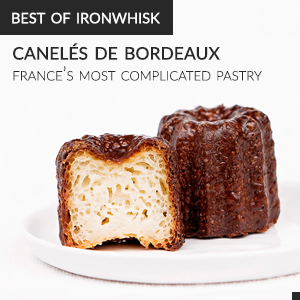 This one actually looks manageable for someone like me…plus I cannot resist a french almond filling. 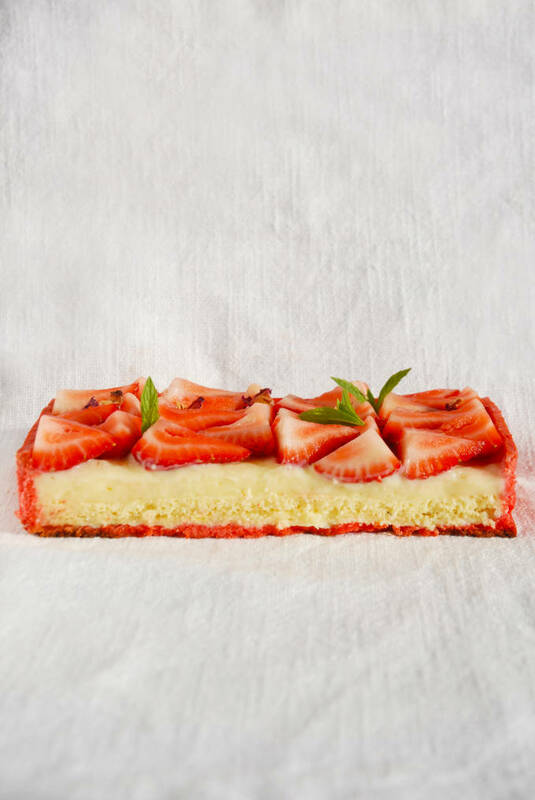 Strawberries and white chocolate are some of my favorite pairings. I’ve got to give this a try soon. I did make a cake like you mentioned in a previous post, when you crumbed the sides of a square cake instead of smoothing the frosting. I gave it to my sister for a birthday cake. I admire your dedication to getting things right. I have come to find that pastry baking requires one fundamental attribute that you just cannot teach: patience with yourself. You obviously have that or you wouldn`t be posting images like this along with such detailed instructions. Very well done. I hope this blog continues to win you supporters and observers, and even those who try your recipes. Hugo & Victor have released a book, not sure if it’s available in English, it has a few really interesting things in it and is (needless to say) stunning in its photos. This must be the perfect dessert for hot summer days! What food processor do you use to prepare the almond sponge cake? I am asking because I’m trying to get this recipe exactly like you – I’m following the exact steps and would like to take some pictures of the process and finished cake. what is the problem with wilton gel color? Wilton gel colours turn dark when baked.